1.What will James do tomorrow ? 2.What can we say about the woman? 4.How does the woman go to work? C.Offering information about a hotel. A.To look at an apartment. C. It's adequately equipped . 16.What will the woman probably do next? 17.Who is the speaker probably talking to? 18.When did the speaker take English classes? C.When he was 15 years old. 20.What does the speaker mainly talk about ? A.How education shaped his life. 例：It is generally considered unwise to give a child _______ he or she wants. 22. Kids shouldn’t have access to violent films because they might _______ the things they see. 23. Self-driving is an area _______ China and the rest of the world are on the same starting line. 24. It’s strange that he _______ have taken the books without the owner’s permission. 25. Developing the Yangtze River Economic Belt is a systematic project which _______ a clear road map and timetable. 26. Around 13,500 new jobs were created during the period, _______ the expected number of 12,000 held by market analysts. 27. There is a good social life in the village, and I wish _______ a second chance to become more involved. 28. —You know what? I’ve got a New Year concert ticket. 29. _______ you can sleep well, you will lose the ability to focus, plan and stay motivated after one or two nights. 30. I was sent to the village last month to see how the development plan _______ in the past two years. 31. Hopefully in 2025 we will no longer be e-mailing each other, for we _______ more convenient electronic communication tools by then. 32. Try to understand what’s actually happening instead of acting on the _______ you’ve made. 33. China’s soft power grows _______ the increasing appreciation and understanding of China globally. 34. Despite the poor service of the hotel, the manager is _______ to invest in sufficient training for his staff. 35. —What happened? Your boss seems to _______. —Didn’t you know his secretary leaked the secret report to the press? 36to pay lawyers’ fees. To make matters worse, Moth was diagnosed（诊断）with a37disease. There was no38 , only pain relief. Moth had just ￡320 in the bank. They planned to keep the41low by living on boiled noodles, with the 42hamburger shop treat. and packed it away early in the morning. The Winns soon discovered that daily hiking in their 50s is a lot45than they remember it was in their 20s. Raynor46all over and desired a bath. Moth, meanwhile, after an initial47 , found his symptoms were strangely48by their daily tiring journey. thought had50forever. "Our hair was fried and falling out, nails broken, clothes51to a thread, but we were alive." Closed Thanksgiving Day, December 25,January 1,and the first Monday in May. $25.00 recommended for adults, $12.00 recommended for students, includes the Main Building and The Cloisters(回廊）on the same day; free for children under 12 with an adult. family/children's programs are free with admission. Ask about today's activities at the Great Hall Information Desk. collection consists of masterworks in sculpture, colored glass, and precious objects from Europe dating from about the 9th to the 15th century. Closed Thanksgiving Day, December 25,and January 1. 56. How much may they pay if an 11-year-old girl and her working parents visit the museum? 57. 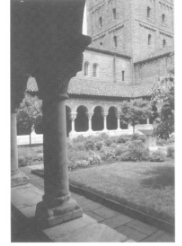 The attraction of the Cloisters museum and gardens lies in the fact that ________. In the 1760s, Mathurin Roze opened a series of shops that boasted(享有）a special meat soup called consomme. Although the main attraction was the soup, Roze's chain shops also set a new standard for dining out, which helped to establish Roze as the inventor of the modern restaurant. 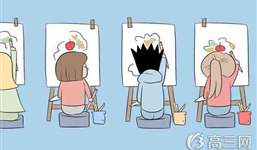 visual hints that influence what we eat: diners served themselves about 20 percent more pasta(意大利面食）when their plates matched their food.When a dark-colored cake was served on a black plate rather than a white one, customers recognized it as sweeter and more tasty. Lighting matters, too. When Berlin restaurant customers ate in darkness, they couldn't tell how much they'd had: those given extra-large shares ate more than everyone else, but were none the wiser—they didn’t feel fuller, and they were just as ready for dessert. classical, rather than pop, music was playing, diners spent more. Fast music hurried diners out. and spent more than those who smelled lemon, or no scent. Meanwhile, things that you might expect to discourage spending—"bad" tables, crowding. high prices — don't necessarily. Diners at bad tables — next to the kitchen door, say — spent nearly as much as others but soon fled. It can be concluded that restaurant keepers need not "be overly concerned about ‘bad' tables," given that they're profitable. As for crowds, a Hong Kong study found that they increased a restaurant's reputation, suggesting great food at fair prices. And doubling a buffet's price led customers to say that its pizza was 11 percent tastier. 59. How could a fine dining shop make more profit? D. Using plates of larger size. 60. What does the last paragraph talk about? A. Tips to attract more customers. B. Problems restaurants are faced with. C. Ways to improve restaurants' reputation. D. Common misunderstandings about restaurants. For example, take the Quick Cut Greens Harvester, a tool developed just a couple of years ago by a young farmer, Jonathan Dysinger, in Tennessee, with a small loan from a local Slow Money group. It enables small-scale farmers to harvest 175 pounds of green vegetables per hour—a huge improvement over harvesting just a few dozen pounds by hand—suddenly making it possible for the little guys to compete with large farms of California. Before the tool came out, small farmers couldn't touch the price per pound offered by California farms. But now, with the combination of a better price point and a generally fresher product, they can stay in business. to the industry. One crucial factor is secure access to land. Competition from investors. developers, and established large farmers makes owning one's own land unattainable for many new farmers. From 2004 to 2013, agricultural land values doubled, and they continue to rise in many regions. Another challenge for more than a million of the most qualified farm workers and managers is a non-existent path to citizenship — the greatest barrier to building a farm of their own. With farmers over the age of 65 outnumbering(多于）farmers younger than 35 by six to one, and with two-thirds of the nation's farmland in need of a new farmer, we must clear the path for talented people willing to grow the nation's food. all backgrounds. With a new farm bill to be debated in Congress, consumers must take a stand with young farmers. 61. The author mentions car industry at the beginning of the passage to introduce . 62. What does the author want to illustrate with the example in paragraph 2? A. Loans to small local farmers are necessary. B. Technology is vital for agricultural development. D. Small farmers may gain some advantages over big ones. 63. What is the difficulty for those new famers? A. To gain more financial aid. B. To hire good farm managers. C. To have fans of their own. D. To win old farmers’ support. 64. What should farmers do for a more sustainable and fair farm economy? A. Seek support beyond NYFC. C. Become members of NYFC. D. Invest more to improve technology. Children as young as ten are becoming dependent on social media for their sense of self-worth, a major study warned. get online, often through “like”. Some change their behavior in real life to improve their image on the web. Some social apps were popular among the children even though they supposedly require users to be at least 13.The youngsters admitted planning trips around potential photo-opportunities and then messaging friends—and friends of friends — to demand “likes” for their online posts. to social media posts quickly, and around the clock. those in the 10 to 12 age group were "concerned with how many people like their posts", suggesting a “need” for social recognition that gets stronger the older they become. increasingly anxious about switching off due to the constant demands of social media. real social media interaction at secondary school." As their world expanded. she said, children compared themselves to others online in a way that was "hugely damaging in terms of their self-identity, in terms of their confidence, but also in terms of their ability to develop themselves". following, all of those come together in a huge way at once." "For children it is very, very difficult to cope with emotionally." The Children's Commissioner for England's study—life in Likes—found that children as young as 8 were using social media platforms largely for play. However, the research—involving eight groups of 32 children aged 8 to 12—suggested that as they headed toward their teens, they became increasingly anxious online. By the time they started secondary school—at age 11—children were already far more aware of their image online and felt under huge pressure to ensure their posts were popular, the report found. day—especially at secondary school when more youngsters have mobile phones. also "take more responsibility". They should either monitor their websites better so that children do not sign up too early,or they should adjust their websites to the needs of younger users. with the growing demands of social media. 65.Why did some secondary school students feel too much pressure? A. They were not provided with adequate equipment. B. They were not well prepared for emotional risks. C. They were required to give quick responses. D. They were prevented from using mobile phones. 66. Some social app companies were to blame because . 67. Children's comparing themselves to others online may lead to . 68. According to Life in Likes, as children grew,they became more anxious to . 69. What should parents do to solve the problem? A. Communicate more with secondary schools. B. Urge media companies to create safer apps. C. Keep track of children's use of social media. D. Forbid their children from visiting the web. 70. What does the passage mainly talk about? A. The influence of social media on children. B. The importance of social media to children. C. The problem in building a healthy relationship. D. The measure to reduce risks from social media. When most people think of the arts, they imagine the end product, the beautiful painting, a wonderful piece of music, or an award-winning performance in the theater. But arts groups bring broader value to our communities. The economic impact of the arts is often overlooked and badly judged. The arts create jobs that help develop the economy. Any given performance takes a tour bus full of artists, technical experts, managers, musicians, or writers to create an appealing piece of art. These people earn a living wage for their professional knowledge and skills. Another group of folks is needed to help market the event. “If you build it they will come” is a misleading belief. Painters, digital media experts, photographers, booking agents and promoters are hired to sell tickets and promote the event. According to the Dallas Area Cultural Advocacy Coalition, arts agencies employ more than 10,000 people as full-or part-time employees or independent contractors. A successful arts neighborhoods creates a ripple effect（连锁反应）throughout a community. In 2005, when the Bishop Arts Theatre was donated to our town, the location was considered a poor area of town. After investing more than $1 million in reconstructing the building, we began producing a full season of theater performances, jazz concerts, and year-round arts education programs in 2008. Nearly 40 percent of jazz lovers live outside of the Dallas city limits and drive or fly in to enjoy an evening in the Bishop Arts District. No doubt the theater has contributed to the area’s development and economic growth. Today, there are galleries, studios, restaurants and newly built work spaces where neighbors share experiences, where there is renewed life and energy. In this way, arts and culture also serve as a public good. Teco Theatrical Productions Inc. made use of Bloomberg’s investment of $35,000 to get nearly $400,000 in public and private sector support during the two-year period. Further, Dallas arts and arts-based businesses produce $298 for every dollar the city spends on arts programming and facilities. In Philadelphia, a metro area smaller than Dallas, the arts have an economic impact of almost $3 million and support 44,000 jobs, 80 percent of which actually lie outside the arts industry, including accountants, marketers, construction workers, hotel managers, printers, and other kinds of art workers. The arts are efficient economic drivers and when they are supported, the entire small-business community benefits. It is wrong to assume arts groups cannot make a profit. But in order to stay in business, arts groups must produce returns. If you are a student studying the arts, chances are you have been ill-advised to have a plan B. But those who truly understand the economic impact and can work to change the patterns can create a wide range of career possibilities. Arts as an economic driver Our communities (71) ______ from arts in terms of economy. (72) ______ of arts’ promoting our economy Arts activity demands a(n) (73) ______ effort. It involves creation, performance, and (74) ______. ★Artists make a living through their creative work. ★Others get paid by marketing the event. Arts have a gradually spreading (75) ______. They could help promote other industries whether they lie inside or outside arts. ★Besides tickets, some jazz lovers will pay their (76)_______ to and from the events. ★Arts contribute to cultural development when people gather together to share their experience and renew their energy. Investment in arts could produce potential (77)_______ economic results. ★TeCo used a $35,000 art investment to attract an overall support of $400,000. ★In Dallas, one dollar invested in arts could harvest and extraordinary return of nearly $300. ★In Philadelphia the arts have created about 35,000 job opportunities for workers (78)_______ arts industry. Art students making a good living With these (79)_______ in mind, art students need not worry about their career and have a(n) (80)_______ plan.